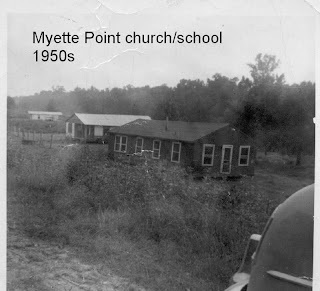 So, they abandoned life on the water for a land-based existence, these families that made up the Myette Point community. The transition came with gains and losses. One of the losses was the convenience of having all your supplies brought to you by the fishboats, so that one of the immediate needs that had to be met was finding a place to purchase provisions such as groceries, staples, fishing equipment, etc. – all of the things the fishboats had previously made available. The nearest source for this that they found was the plantation company stores and one privately owned store of a similar nature. 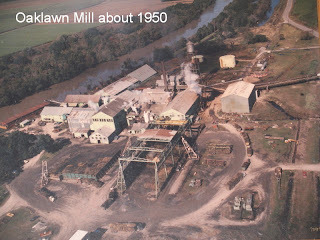 There were two sugar plantations that were somewhat near to Myette Point - Oaklawn and Bellevue. Each of these had a company store that could provide the basic needs of the families, and the other one was a private establishment owned and operated by Medric Martin since 1935 and continuing today. 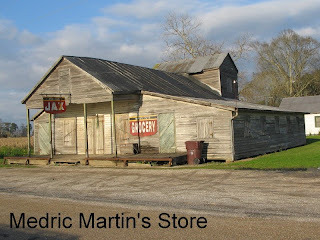 Early on, the Martin store, known to all local people as “Medric’s”, became the primary location for the needs of the new community at Myette Point. It was about three miles away by dirt and gravel road, while the Bellevue store was about five miles from Myette Point. Interestingly, the Oaklawn plantation store was closer but does not seem to have cultivated business from the new community. They went, instead, to Medric’s. Mr. Medric is 95 years old as this is written, and he has many memories of the early days of Myette Point and its people. He speaks favorably of them with respect to their ability to function in a frontier environment, and of their honesty in commercial dealings. In the first few years he would deliver groceries to the levee when the road was dry, and he often hunted ducks with them. As always in any fishing activity, not all fish were considered prime saleable items. The familiar catfish and buffalo were almost always marketable, but not so garfish and choupique (bowfin). Boys who caught such fish saw opportunity in a public not averse to eating them. This population was primarily the black workers of the plantation population. Whenever a garfish or choupique was caught, the boys would walk the two and a half miles to the plantation and sell their fish to enthusiastic buyers there. However, there was a catch to these sales that provides an opportunity to mention a part of the plantation economy not often discussed today. It is the token system. On some plantations, such as Oaklawn, there was a double method of payment used. The more familiar one would be the one where cash was paid to employees at an agreed upon rate for work done. This was paid monthly. The other method used tokens. It seems that if an employee ran out of cash between pay periods, they could appeal to the plantation on a day called “order day” for an advance on the next pay day. This advance would be made to them in the form of tokens, metallic coin-like pieces that had monetary value assigned by the plantation. The tokens could only be used at the company store. Enter the Myette Point boys. 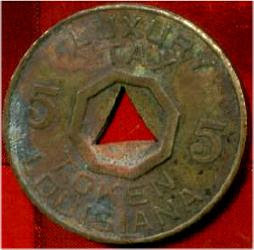 When they sold their garfish and choupiques to the plantation workers, they often received tokens as payment, which in turn could only be used to buy things at the company store. They did accept this form of payment for their fish, not having much option. Edward Couvilleir and Bootsie Millet talk about this. EC: I remember…I remember when we used to catch a gar, a choupique or somethin me and Bootsie took [off] and head to the front with that sucker to sell it. EC: Yeah lord! They had a oak tree about…almost middle ways along the trail [in the fields] goin to the lake, and that’s where you stop and rest, under that oak tree. EC: Big old tree, man! There wasn’t no such thing as ridin…walk to the front, over here. And they had them tokens out here, that’s what they’d pay us for the fish with, tokens. [. . .] That’s what they had at Oaklawn. EC: Tokens. They had a triangle hole in the middle of em. Yeah. You had to buy from Oaklawn Store with that. The token image is from the Exonumia website. The river is at 13.2 feet on the Butte La Rose gauge, rising just a little in the next few days. The Mississippi and Ohio will encourage falling stages on the Atchafalaya after that. The river shrimp are starting their migration 30 miles south of here. They should be here in two or three weeks. Fun to see at night. Most of us assume that the word “education” means reading, writing and arithmetic, and in the restricted sense that would be true. In this restricted sense, these are learned skills that would be taught by paid teachers in some sort of dedicated building. But, of course, in so many ways the true education received by people in general includes much, much more than that. A definition of education in this more general sense might emphasize the need to learn those skills necessary to provide food, clothing and shelter for oneself. Perhaps the need for social skills might be added to this. The Myette Point families had ample education in the general sense. They learned to convert energy into food and shelter at an early age. They learned the social skills needed to thrive in close living conditions. They learned how to apply established techniques to the problems of everyday lif e, and to discard those that were not workable – always substituting some variation that might work better. Government agencies have only recently learned this useful process; they call it adaptive management, as though it was a new thing. If food, clothing and shelter are the primary criteria for life, and skills for achieving those things are available from mentors all around you, then the other skills are simply not essential. During a certain period of time, then, reading, writing and arithmetic were not necessary to living a successful life in the Basin, and the absence of schools for teaching these things was not a serious issue or a disadvantage. However, even in the Basin some of the Myette Point families had opportunities to learn in the schoolroom. 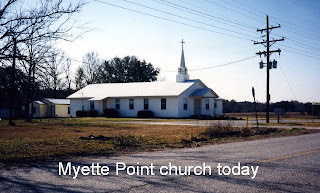 There were two of these schools; the first one in the central Basin on the island known as Hog Island and the other, later one, on the levee after the Myette Point community had been formed. Both of these were the results of efforts by Baptist missionaries to bring religion and learning to Basin inhabitants. The most memorable religious influence, at least to people who l ived there, began with the building of the Little Brown Church. This floating building was used all up and down the middle Atchafalaya region for Baptist missionary work. There were two of these. The first was dismantled and used to build the Hog Island school. Margaret Couvillier Neal was a student at the school. The teachers at these Baptist missionary schools were often members of the missionary community. Sometimes they were the wives of the missionary men. It should be mentioned that, prior to the Baptist activity, there was Catholic missionary work in the Basin also, in the person of a Father R.J. Gobeil. With his own boats, he moved himself around the Basin, ministering to the houseboat communities where he found them. Even though there was education offered, it tended toward progressing in stages through the Catholic religion, and there is no mention of interest in starting schools where secular learning could be had. On the other hand, the Baptist missionaries tended to promote schools within the larger framework of general education. Incr easing pressure from government policies regarding compulsory education was one of the reasons why the Myette Point families decided to leave the Basin and the houseboats they had lived on for generations. Most people migrated to towns and could take advantage of school facilities existing there. 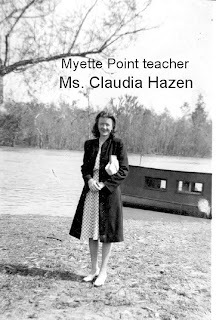 The Myette Point families did their best to comply with the required school experience and still continue to live and function in close harmony with the Atchafalaya. They moved to Myette Point and then started sending their children to Franklin schools. This did not work due to the difficulty of getting the kids to a bus, about three miles over dirt/mud roads. 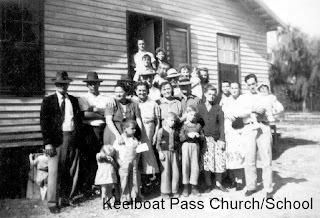 After leaving the water permanently, all of them by 1950 or so, the requirement to send the children to school and the difficulties this still presented, attracted more effort from Ira Marks, the Baptist missionary who had been responsible for setting up the school and missionary church at Hog Island more than a decade earlier. The primary difficulty was in getting the school-age children living on the levee to a place where a school bus could pick them up. In the early years, this meant someone driving them to “the front” over questionably passable dirt/mud roads the distance of about three miles. In rainy/muddy weather, they had to walk. Noting this difficulty, and in collaboration with the Baptists, the community built a school on the skirt of the levee that functioned for three years. The school was finally closed when a road was shelled (the building continued to function as a church), improving it to the point where a school bus could reach the levee and transport the children. 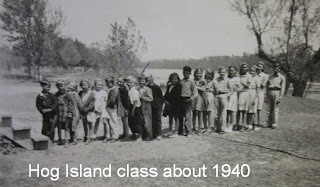 The children born after about 1945, then, were all schooled first in Franklin, then at Myette Point until the road was improved, and then most of them finished in Franklin. So, education, formal education, has that kind of history in the four generations of people who make up the Myette Point community. Literacy was spread widely in people born around the Basin in the 1850s, it was not prevalent in those born from 1880 to 1940, and then it was again prominent. It is interesting that literacy, when not necessary to day-to-day life, can be so easily discontinued. Having been a factor in the first generation, it was not encouraged within the second and third generations, and then was reestablished as a functional tool by the fourth generation. Today, children born to the fourth generation are themselves teachers, lawyers, accou ntants, religious leaders, and many other professions that take formal education for granted. The black and white pictures are from the collection of Darlene Soule and from Artie Buck. The river is at 16.7 feet on the Butte La Rose gauge, falling slowly to 15.0 feet by the 17th. Nothing in the Ohio or Mississippi wants to extend the high water this year. Looks like we have had what we are going to get. 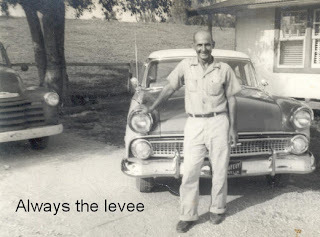 Since this story is about the Atchafalaya Basin and the people who inhabited it, there can be only one levee to speak about – the one that fundamentally changed the Basin and the way the people related to it. It was built in the 1930s as a result of the flood of 1927, the latter having taken place at a time when the Mississippi floods could cause national rather than only local distress, and at a time when the federal government was ready to do something to prevent similar floods in the future, if possible. The new national outcry to “do something” was met with the Flood Protection Act, enabling the federal government to apply planning and funds toward effective flood prevention for the first time. It was this Act that mandated the levees in the Basin, changing it forever. 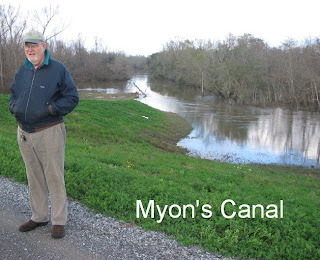 Where there had previously been only a huge natural overflow basin for the Atchafalaya River, there was now a somewhat lesser basin with hundreds of miles of manmade levee totally defining the flowage hydrology in the swamp, and restricting it to the will of man, so far. There are, of course, two levees around the Basin, the East and West Protection Levees. But using the term “levee” in singular form is desirable here. 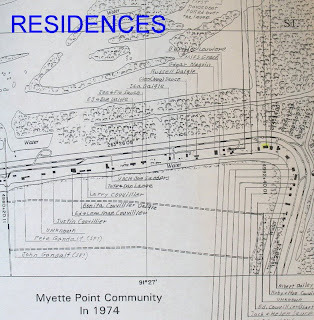 It is always referred to in singular in the interviews with the Myette Point families because the concept of what the levees meant is an overriding and all-inclusive idea. 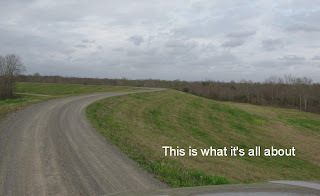 Consequently, “the levee” means more than a ridge of dirt extended for many miles. It means in aggregate all the adjustment s that had to be made and all the environmental changes that took place. It was at one time a barrier to travel and a provider of a new means of travel. It brought an opportunity for changing lifestyles. It made life on land possible and life on the water harder. It gave life and it took life. “The levee” did these things, and more. When it was built, did this new thing, this long dike, cause the Basin residents to rise up and create petitions, or march on someplace, or start campaigns citing potential environmental degradation? No, it did not. The people most affected by the levee were not activists in a broad sense; that kind of aggressive response is mostly for those who can view effects from outside a situation. The Basin people were on the inside in the strictest sense. They were the ones who were so intertwined with the environment that they were almost part of it, and so had to adjust to the changes around them, or succumb to them. Most people made the adjustment, for as long as the changes were not lethal to life, they could be absorbed. Old ways disappeared and new ways emerged. 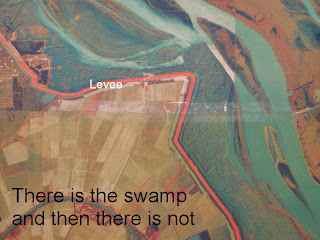 The presence of the levee to the Myette Point families is so significant that their existence in the Basin can really be divided into the before and after levee construction. So, before the levee, what was the Basin like? It was a vast, open, unrestricted piece of semi-aquatic environment mostly unattractive to human beings. It had many characteristics that made it uncomfortable to people. 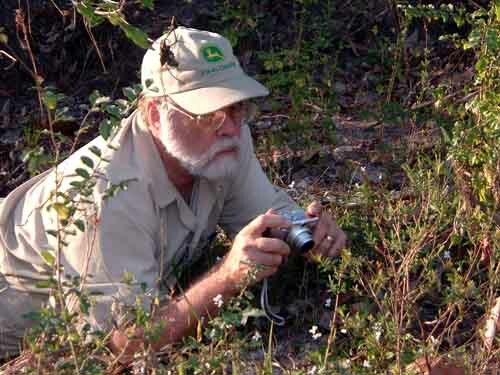 It had mosquitoes, and snakes, and water and mud – all of which civilization tends to eliminate over time, if it can, by spraying the mosquitoes, killing the snakes, draining the w ater and drying up the mud, and so making living easier for some fraction of the human population. But for a long time the Basin defied attempts at those modifications, simply because it was so big. Modification was only possible on a grand scale, but the Basin met its match in that the building of the levee was just such a large-scale modification. In cutting through drainages, the levee restricted one of the Basin’s primary inherent features, its watercourses. Subsequent realignment and dredging applied to these watercourses was enough to initiate changes that would redefine the Basin environment forever. People who lived in the Basin had different responses to the flood of 1927. If they lived on land, the water inundated their houses (to a depth of 12 feet on Hog Island, a previously thought to be safe place). It drowned their chickens, cows and other livestock. Gardens and fruit trees were killed by the flooding that lasted for many weeks. If people lived on houseboats, however, the obvious merits of rising with the water are apparent. Th e older generation (Blaise Sauce) of Myette Point people was already on houseboats and some of the succeeding generation too. These people tied their boats along upper Bayou Lafourche along with other houseboats. When the water receded, many people returned to the land they had relinquished to the high water and rebuilt their lives there. Others moved their houseboats back into the Basin. To these Basin residents, the political response to the 1927 flooding was not very apparent during the next few years, but the big changes had been put in place and the new resolve to prevent future catastrophes was effective in putting the money and people together. The levee was going to be built, and there would be big changes in the flow of water in the Basin. The higher volumes of water every year, and the restricted flow in the deeper Basin channels, created swifter currents and more dangerous whirlpools. The small boats used by the people were not meant for these hazardous conditions, push skiffs being particularly susceptible to whirlpools, or eddies as they were sometimes called. Putt Couvillier had memories of someone who was still trying to fish in 1941 or 1942 with a push skiff. He notes how dangerous fishing in the strong currents generated subsequent to the building of the levee could be. 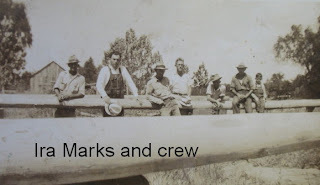 Just as was the case in the timber industry, work offered by the levee project was eagerly accepted by the Basin people. They were already good at the things needed to build the levee – the expertise with tools and machinery was highly valued. And truly, by engaging in these actions, the families helped shape the future of their own landscape. They helped build the conditions for the end of the Basin as they had known it for generations, and they built their own bridge to a future on land and all that that entailed. It was a bridge in that it was the transition to living on land. Because that is so, it is important here to realize that the newly built levee was now functioning as a gathering place for people trying to leave, and in some ways trying to remain close and not to leave, the Basin. Eventually 15 houseboats would congregate in Myon’s Canal, live ther e for a few years, gradually getting used to the new conditions, and finally moving over the levee. So, there was a before and after phase to the placement of the levee in the Atchafalaya Basin, with the construction of the levee as the central defining point. Before the levee there was unfettered access to anywhere in the Basin that there was water to take you. After, there was restricted access, the restrictions dictated by the levee itself. Before the levee there was an open Grand Lake, miles across and miles long. After the levee there were narrow bayous and land where before there had been only water. 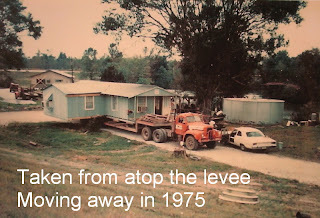 Before the levee there were people living their whole lives in the Basin. After the levee there were no longer people living in the Basin. 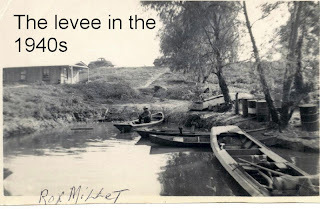 But the levee was a generous home to the Myette Point families for 25 years, beginning in about 1950 and ending abruptly in 1975. During that time, four generations of the families lived there. The last generation was the only one that did not experience houseboats as a way of life. It was generous, and then, in a way the levee evicted them. The 1972 high water threatened to overtop it, which in turn caused the Corps of Engineers to have to do levee repair at Myette Point. 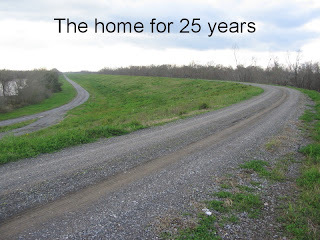 The people were living along the levee such that they were in the way of the repairs, with no legal right to be there, and the Corps required them to move. As a group, most of them moved to a location on Bayou Teche, but that’s another story. The picture of moving is from Edward Couvillier and the two black and white ones are from the Darlene Soule collection. The River is at 18.6 feet on the Butte La Rose gauge, heading down to 17 feet in the next five days. The Ohio and Mississippi are not sustaining any more high water at this time. 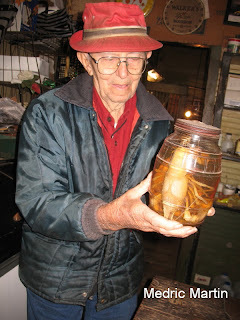 Time to think about getting crawfish traps out of shallow swamps. Too bad, but it is June, after all.